Conan O’Brien is actually writing up his own Twitter posts. But as a gag, he posted a Twitpic along with an update: “This is how many people it took to write today’s tweet: ‘Jumbo’ shrimp? WTF! 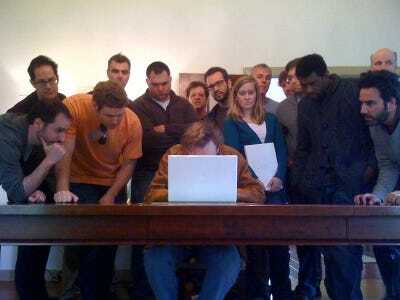 !” That’s, count ’em, 15 of Conan’s friends and writers. Ha! Take that all you Twitter ghostwriters. So what are they all doing huddling around Conan’s laptop? Perhaps planning new jokes for that tour… or scheming for his new TV show.